Modern apartment built in traditional Swedish style in the center of the village Kloten, located in the heart of the Malingsbo-Kloten Nature Reserve. 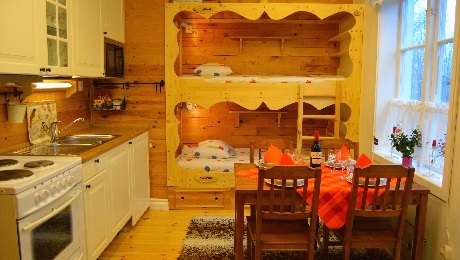 The 21 m2 apartment has a fully-equipped kitchen, 4 traditional beds, a bathroom and free Wi-Fi connection. The apartment Kloten City is only available from the 12th of October to the 15th of April. 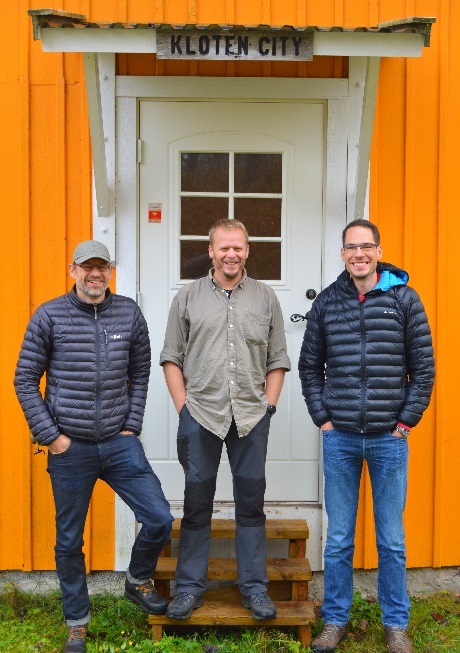 During the summer period, Kloten City is reserved to Nordic Discovery's extra staff members. For stays during the summer period please check the Wilderness Lodge and the Wilderness Cottage. Price: 450 SEK/person when the apartment is booked as a private apartment. 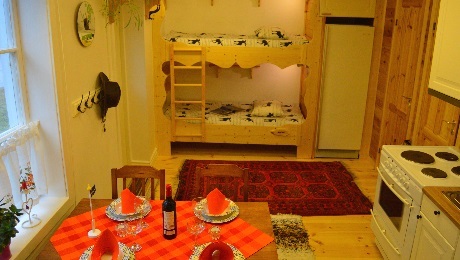 Price: 450 SEK/person when the apartment is booked as a shared apartment. No single supplement. Additional options: Sheets and towels for the stay, 100 SEK/person. Breakfast with homemade bread and cereal, 100 SEK/person. If you are by yourself and wish a private apartment, the supplement for a single apartment is 250 SEK/night. The name Kloten City comes from the central location in the small village Kloten (with 30 inhabitants). Dutch speaking visitors are easy recognized in Kloten because no other visitors are taking photos of the road signs. Why? Kloten is a rude word in the Dutch language, so the name Kloten comes out very funny.